Back drop, naturalizing, woodland edge. A favorite of the hummingbirds at my place. Old fashioned, very easy. Not for lily enthusiasts. Lives for years, multiples well. 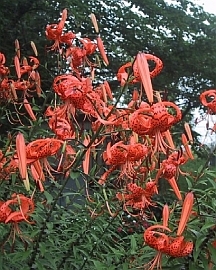 The 'bulbils' that form along the stems can be planted.